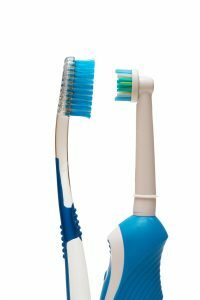 Electric vs. Manual Toothbrushes? Which is Really Better? Next time you are in the grocery store, we urge you to peruse the toothbrush section. Every package advertises something unique, special, or better than the competition. The decision regarding what toothbrush to purchase can be daunting. At Pelican Landing Dental, our blog is a terrific way to educate our readers about oral health and current topics in dentistry. Today we would like to discuss the toothbrush. Are electric toothbrushes really that much better than manual? We hope you enjoy! We will simplify the discussion by claiming that there are two major types of toothbrushes; the manual and the power brush. Within the manual brush types, we see much variation. Head design can be regular or diamond shape. Brush design can be block pattern, v-shape, multilevel trim, or criss-cross. Handles can be straight, contra-angle, flexible, or slip prevention grip. Does any of this really matter? Stay with us and we explain. Electric toothbrushes have two basic variations. First is the rotation oscillation brush. The Oral-B designs are the most popular. These brushes have a small round head that rotates and oscillates. Oral-B claims that these brushes have the highest in plaque removal and are ideal for reaching hard to reach areas in the mouth. The other variation is the sonic style brush. The best selling example of this is the Sonicare. he head of these brushes looks like a normal manual brush which vibrates rapidly. Sonicare claims optimal results with gum health. Why Use a Manual Toothbrush? Potentially the best reason to use a manual brush is cost. Powered brushes are more expensive. Additionally, some people like the feel of a manual toothbrush in their hand or mouth. Electric toothbrushes have several advantages over the manual brushes. People with limited dexterity have a much easier time adapting an electric toothbrush to the tooth and gum surfaces. These brushes do not rely on the back-and-forth or small circular motions that manual brushes require to be effective. In addition, many report a therapeutic benefit to the powered brush from the vibrating or oscillating motion of the bristles on the gum tissues. Finally, some electric brushes have extra features that can be beneficial, including timed beeps to let the user know when to move to the next segment of the mouth. There have been several good studies that have been designed to test the differences between manual brushes and electric brushes. Before we discuss these studies in detail, let’s look at the results. Most of the studies investigated the difference in the levels of plaque that could be removed with each type of brush. We know that plaque is the main starting point and cause of gum disease so these levels seem logical to investigate. What is found repeatedly is that the best plaque control came from the use of the rotating oscillating brushes followed by the sonic style brushes. The manual brushes had the least effective plaque control of each of the methods tested. A systematic review was completed in 2004 that evaluated results of over 2,500 participants. They found that one type of electric brush reduced plaque levels by 7% and gingivitis by 17%. Does this mean that you have to go out and get a powered brush? To answer this, we need to look just a little further into the studies. First, several studies do not mention how the subjects of the study were trained to brush. We know that technique is very important for plaque removal and the only reported criteria for the users of the manual brush appear to be a lack of disability. A few researchers have actually trained the manual brush users in proper brushing methods. The result was that the gap in plaque control between electric and manual brushes lessened. We hate to say it, but the answer is to brush! We know from decades of data that proper brushing techniques lead to great oral health. An electric toothbrush could help get us to that goal and may be a great answer for many patients. It is important to note, however, that nothing beats two sessions per day for two minutes each. The strongest positive predictive factor in tooth brushing studies is the amount of time spent brushing. If you want to stick with a manual brush, we encourage you to read our past blog “Are You Sure You are Brushing Your Teeth Correctly?”. This will help ensure that you are getting the most out of each session. If you stick with a manual brush, we encourage you to find a soft bristled brush that you like and will use. No studies that we can find have shown any real significance in results from one manual brush design to the next. Proper time spent brushing and technique have been found to be paramount. We welcome questions or comments at any time. Feel free to contact us at (239)449-6104.